Previously: Gambit after the Age of Apocalypse! These were the days when Marvel was in serious financial difficulty, and editorial control became prescriptive to what can only be described as an insane degree. Steve Seagle had planned to leave Gambit out in the cold for at least a year – he tended to dislike the character, as he didn’t feel he was a genuine ‘Southern States’ guy – but these were among the plans he was forced to change. The climactic events of Uncanny X-Men #350 were quickly rewritten; we learned that Rogue had been influenced by Gambit’s own self-loathing when she left him in Antarctica, and she kept heading back to see if she could find him. The Cajun charmer himself returned in Uncanny X-Men #361, even gracing the cover! That being said, the line “Because you demanded it” should really have read, “Because the editors demanded it…” The issue was pretty lacklustre. Gambit’s survival wouldn’t be explained until 1999’s Gambit Annual, where Gambit agreed to perform one mission for the villainous New Sun. And so Gambit returned to grace the pages of Uncanny X-Men once again, in an era where the two series – Uncanny and Adjectiveless X-Men – soon began to cross over a lot once again. Setting the pattern, it was in X-Men #81 that Gambit really dealt with the ‘X-family’ he’d betrayed. In a rather sweet development, he proved extremely protective of Marrow, who was the girl he’d rescued from the Marauders all those years ago. It turned out Gambit was more important to the Thieves’ Guild than he’d suspected, and he wound up leading (for a time) the combined Thieves and Assassins. This was a nice about-turn to the guy who’d been exiled, and was fairly well-handled. 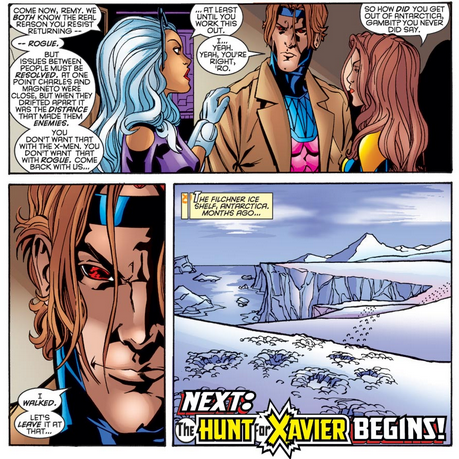 In a time-travel storyline, Gambit visited the past and encountered Sinister. He returned to the present day energised, with the revelation that he’d been forced to have his powers limited once before. This was broadly hinted as being the debt he owed Sinister, the reason he was forced to help gather the Marauders. Finally, Gambit struggled against the mysterious New Sun, who – in the 2000 Gambit Annual – was revealed to be an alternate-reality version of Gambit himself! The issue ended with Gambit taking charge of an X-team, a leader among the X-Men for the first time – and trusted in spite of his past. Events spun out, with the two X-teams colliding, and in #385 Claremont re-ignited the romance with Rogue. Gambit appeared in both Uncanny and Adjectiveless once again for a few issues (specifically X-Men #104-109), until Rogue led a team away from the Mansion. She didn’t want Gambit close, in case her out-of-control powers inadvertently hurt him. 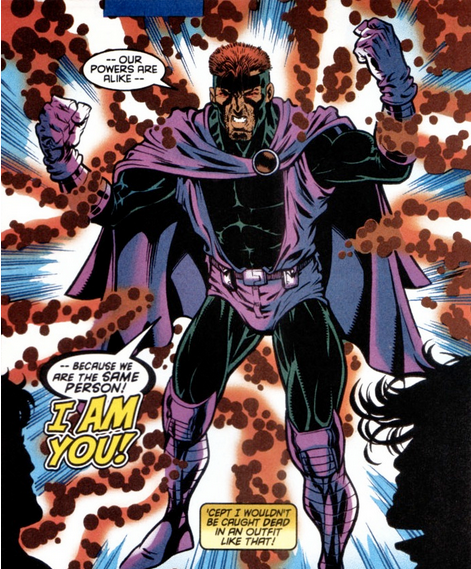 The Cajun then appeared in a Gambit and Bishop miniseries, introducing the celestial anti-Phoenix-Force Bete Noir. The Cajun left the Mansion, returning to his thieving lifestyle, but soon wound up involved with Rogue’s team anyway – with a constant presence in X-Treme X-Men, with Gambit collecting gemstones of power. 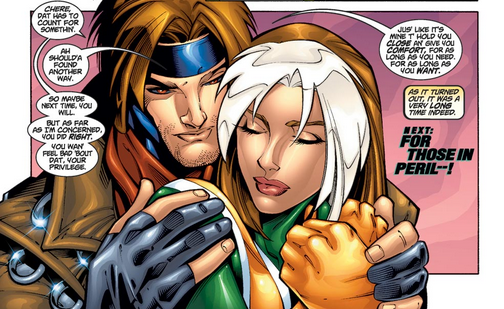 In X-Treme X-Men #16, Rogue was willing to give her life to save Gambit; Gambit almost died in the aftermath. The two were left powerless, and pursued a normal romance, away from the X-Men. They still considered themselves X-Men, though, as proven in the X-Treme X-Men X-Pose and #35 onwards. Gambit’s powers were finally restored in #46. 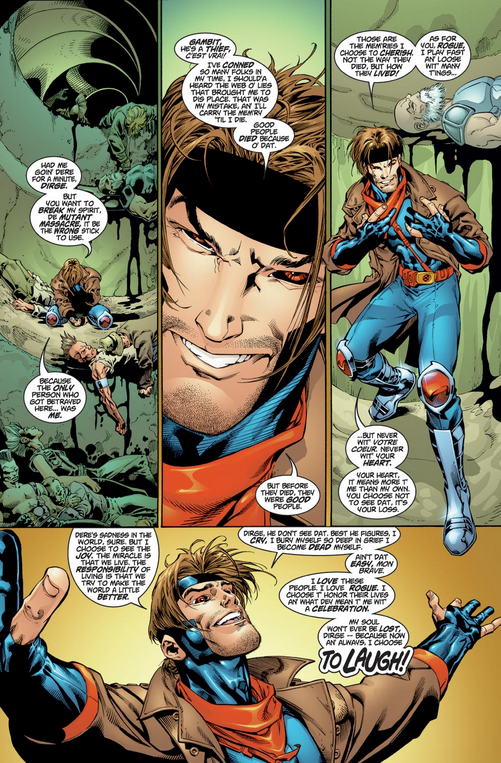 Gambit returned to the pages of X-Men, as part of Chuck Austen’s controversial and unpopular X-team. 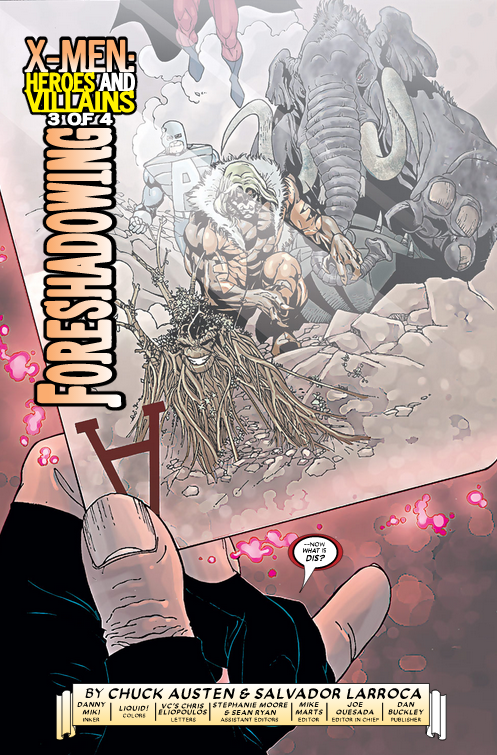 He was blinded in #160, and was left highly dependent on Rogue; this blindness led to changes in his abilities, with Gambit perceiving the spirit-world in the Rogue series (where he was a frequent guest-star) and proving able to catch glimpses of past and present through his playing cards in X-Men #163. Again, editorial intervention led to Gambit being restored to normal by Sage in X-Men #165, in time for Austen to be replaced as writer by Peter Milligan. Milligan started out with the Golgotha plotline, in which Gambit wound up fighting shadows and the relationship between Gambit and Rogue grew increasingly strained; this culminated in X-Men #171-174. Rogue and Gambit turned to Emma Frost for advice, while Mystique made a weird attempt at seducing Gambit. Tom Bacon is an old-school Marvel fan, a blogger on http://www.mahmusecomics.com and an admin on the popular X-Men Facebook page (https://www.facebook.com/groups/XMENFANS/). In Real Life, he's currently working in the field of Knowledge Management at The Co-operative Bank, and is happily married to wife Fiona.